If you’ve ever used keyboard shortcuts, you know how helpful they can be when it comes to knocking out work faster. Although it may look like learning them is more of a hassle than it’s worth, once you start incorporating keyboard shortcuts into your workday, you’ll find that you’re able to complete items on your to-do list much more quickly than you were before using them. Fortunately, Business Management Daily is offering a FREE Tip Card to help you become more productive and efficient in the office. 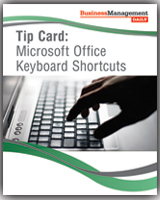 This resource includes shortcuts for Microsoft Excel, Outlook, PowerPoint and Word. Yes! Send me the FREE Tip Card! Print out the tip card and keep it at your desk for easy reference throughout the day.